We imagine there isn't any feeling that compares to the pure joy a player or coach feels after winning a Super Bowl. To have all of the hard work and dedication culminate into something special is a feeling that is so unique, no matter how many times it happens it still feels incredible every single time. For the Patriots, the joy from winning another Super Bowl in the most dramatic fashion of all-time will probably last well past the parade on Tuesday, and although the focus now shifts to defending their spot on top of the mountain, they'll enjoy this one for a while. 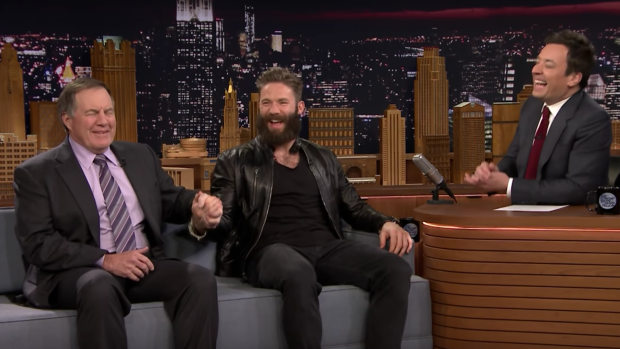 Monday night, Julian Edelman and Bill Belichick were guests on The Tonight Show With Jimmy Fallon, and both guys were cracking jokes and sharing laughs as they discussed the Super Bowl, Edelman's catch and much more. We've never seen Belichick laughing and smiling that before. As Fallon pointed out, we're used to seeing the coach in him. That being said, winning brings out the happiest emotions in people, and that holds true with the world's most intimidating coaches.